• C. Zervos, Pablo Picasso: Supplement aux volumes 1a 5, Paris, 1954, vol. VI, no. 1396 (illustrated). • H. Chip and A. Wofsy, The Picasso Project : Picasso’s Paintings, Watercolors, Drawings and Sculpture: A Comprehensive Illustrated Catalogue 1885-1973, Neoclassicism I 1920-1921, San Francisco, 1995, no. 20-460, p.143 (illustrated). • J. Palau i Fabre, Picasso: From the Ballets to Drama (1917-1926), Madrid, 1999, no. 882, illustrated p. 240, text reference p. 243. • Mallen, Enrique, ed. Online Picasso Project. Sam Houston State University. 1997-2017. OPP.20:365 ills. • Saidenberg Gallery, New York. In 1917, Jean Cocteau arranged the first of several commissions for Picasso to design the sets for Diaghilev’s Ballet Russe in Rome, and Picasso followed him there for a couple of months. This was Picasso’s first trip to Italy and his first real exposure to Greco-Roman antiquity. His sojourn in Italy was to have far-reaching consequences for his art. While all along adding to his vast panoply of synthetic cubist iterations, Picasso at the same time set out to capture Classicism and make it his own, and he did so, typically, in more ways than one. At one extreme, he created rather naturalistic renditions of Diaghilev, Stravinsky, and some of the dancers including Massine and his future wife, Olga. At the opposite extreme, he developed a novel idiom for creating sculpture without having to resort to hammer and stone–sculptural painting. He had already created one general style of sculptural painting, epitomized by Les Demoiselles d’Avignon, where the figures as well as the space surrounding them seem hewn out of rock. Now he created a new cast of characters, classical in their features right up until the moment he inflated their bodies to the bursting point like a turgid balloon. In the cases of related paintings and drawings in Picasso’s ouevre, quite often the painting is by no means more accomplished or more beautiful than the corresponding drawing. Oil paintings bring possibilities of expression unique to that medium or to colored brush painting in general, but so do drawings. Paintings are usually larger in scale; drawings are often a more intimate affair, requiring closer viewing. In the case of this drawing and its related painting, the painting is certainly a great work. Yet some of the greatness of this drawing is lost in translation to canvas. The following is a pretty strong statement, but if the value of the drawing and painting were the same, I would choose this drawing. According to John Richardson (Picasso: The Classical Period, New York, 2003, p. 15), these works were inspired by the the famous fresco, The Recognition of Telephus by Hercules, which Picasso would have seen while sojourning in Italy in the Museo Naxionale of Herculaneum. Both painting and drawing show the same apposition of hand to face, finger to mouth’s edge, as in the depiction of the central figure of this fresco. 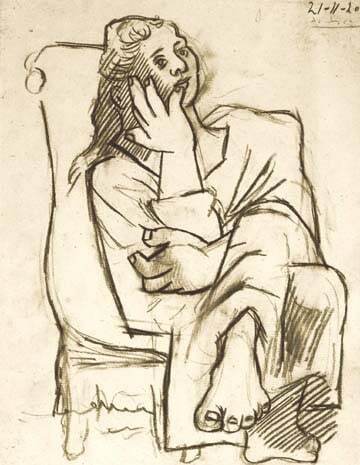 This drawing in particular, as well as one other closely related drawing, reveal Picasso’s take on the dreamy, lost-in-thought expression of this lady in plaster. 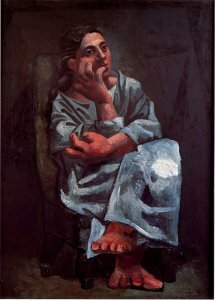 This seated woman provides an interesting insight into the workings of Picasso’s mind, or, more specifically, the flow of his creative juices, especially when regarding the tentative, initially more proportional rendition of the left hand, prior to its assumption of its final, gargantuan state. This progression presumably reflects Picasso’s realization that only comically swollen hands could suit his present purposes. The right foot in this composition is by contrast disproportionally small and unfinished, which appearance may be elucidated by the following explanation. Shortly before Picasso created this drawing, Olga had broken her leg, an injury, as has been surmised, which ended her ballet career. This injury probably explains the hatch marks across the right foot, and its foreshortening as also seen in two other related drawings created that month, clues, typically veiled as was his wont, to a true life-event. The full-blown expression of Picasso’s two-dimensional “sculptures” were for the most part saved for the more plentiful paintings of this style. 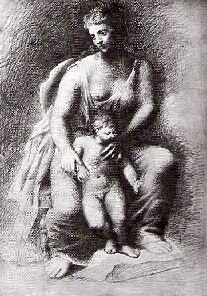 He must have felt that painting was better suited for his colossal creations, whereas he clearly preferred a more delicate touch for this conté crayon drawing and the one directly related charcoal, as well as for several other stylistically, if not thematically, related works on paper of the period. This breathtakingly tender, poignant, revolutionary, yet amusing drawing has achieved immortality with a place of honor in Picasso’s pantheon. They are not exactly portraits of Olga and the baby Paulo but perhaps neoclassical stand-ins for them. Furthermore, this more realistic drawing is not as interesting or Picasso-esque, and it suffers in comparison by lacking the humorous acromegalic distortions characteristic of the full-blown sculptural neoclassical phase of which the present drawing is an exemplar. 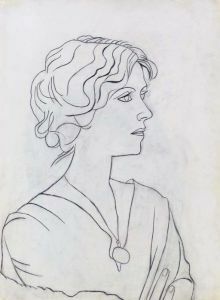 This “pretty” picture, Portrait d’Olga (1920, pencil on paper), is admittedly larger than the work at hand but quite flat and uninteresting by comparison. Nonetheless, it fared predictably well, fetching $2,592,000 in November, 2006. Finally, a brief word about the medium of our drawing. Picasso rarely used conté crayon, which is one more reason why this drawing is exceptional. Picasso’s line fairly glistens from its waxy pigment, rendering this portrait all the more striking.